Natural gas as it comes out of the ground is mostly methane, but can also have around 19% other components, such as ethane, propane, butane or nitrogen. In the liquefaction process used to produce LNG most of those other components are removed, leaving primarily methane. The gas is made liquid by chilling it below its boiling point of about -160 degrees Celsius. It’s not pressurized, as some folks think; LNG is transported at about normal atmospheric pressure. But it is very, very cold. In its liquid state, it occupies 1/600th of the volume it does in gaseous state, making its transport by ship commercially practical. In this liquid state, it will neither burn nor explode. The cryogenic temperatures involved make it imperative that metal coming into contact with the cargo – tanks, piping, pumps – has to work at those low temperatures without becoming brittle and cracking. A famous accident involving LNG that took place in Cleveland during World War II graphically illustrated this. In 1944, due to wartime rationing, a new storage tank was built of steel containing only 3.5% nickel (today’s standard is 9%). The low-nickel steel tank cracked, spilling LNG, which began to vaporize. The vapors flowed into the city sewer system, eventually found an ignition source, and the vapor confined in the sewer exploded (had the vapor not been confined, it would only have burned), causing widespread fires and killing 128 people. The low-nickel steel used in that tank wasn’t safe for cryogenic use. That lesson has never been forgotten. An eyewitness related this incident aboard a launch serving a LNG terminal: a cryogenic container was secured on deck for transport. A faulty valve on the container allowed liquid nitrogen to drip on the launch’s ordinary steel deck for several hours. When the crew boarded the launch to make their run, they found that the steel deck and underlying structure was badly cracked, and the launch had to be gently towed to a yard for extensive repairs! So materials suitable for cryogenic use are critical for safely handling LNG, and they’re used everywhere we store or handle LNG, ashore or afloat. With regard to ship’s cargo tanks, there are various types. The most recognizable are the spherical Moss type – four or five enormous balls protruding from the ship’s deck. These inspired the phrase, “It takes balls to move LNG”, emblazoned on a T-shirt a friend of mine owned – he had worked on the Indonesia-Japan run. But it doesn’t, really – there are also the various types of membrane tanks, which look like a bulky, boxy superstructure built on the cargo deck. Membrane tanks are gaining popularity over the Moss type, but they all work well. We mentioned that LNG boils at about -160 degrees Celsius, and during the voyage some of the LNG cargo will boil off. Older LNG ships, and some newer ones, used this boil-off gas (BOG) for fuel, but newer ships may also have liquefaction equipment to capture the vapor and return it to liquid form. Either way, BOG can’t be retained in the cargo tank, which has to be kept at something close to atmospheric pressure; so BOG is either burned in the ship’s steam turbine plant, liquefied or – if nothing else will serve – vented to the atmosphere. 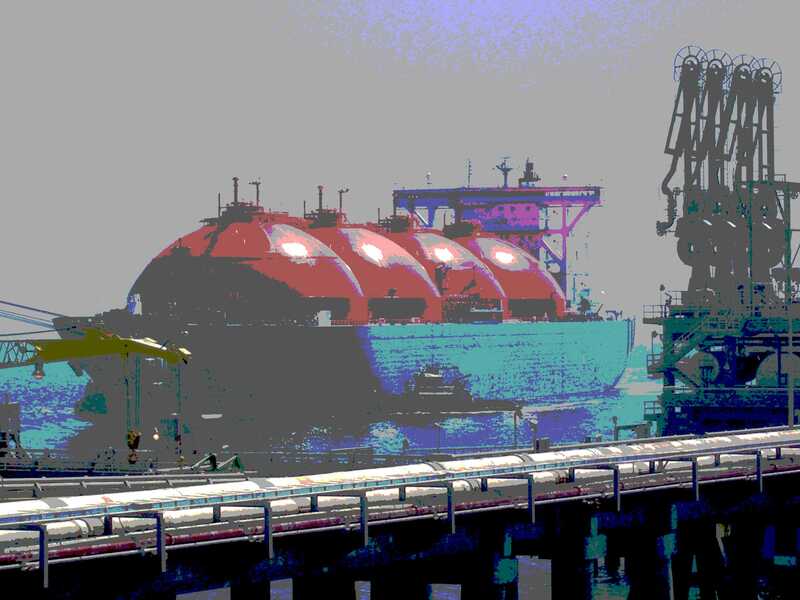 LNG delivery terminals receive LNG, gasify it, and send it out into the pipeline system. Terminals vary in their ability to receive ships with warm (say -159 degrees C) or slightly pressurized cargo tanks. They state their limits in that regard, and in some cases ships unable to lower cargo temperature or pressure to those limits have been re-routed from their intended terminal, to another terminal that could handle their cargo at that temperature/pressure. Newer terminals usually have more latitude in this regard. One type of LNG tanker – the Re-Gas Ship – can act as both tanker and delivery terminal. Excelerate Energy has built several of these. They dock to an underwater turret buoy that mates with the tanker near the bow. The turret serves both as the tanker’s gas connection and her mooring point. Once mated up, the ship can gasify its own cargo and send it out into distribution pipelines, bypassing the need to build a LNG gasification terminal ashore. The Re-Gas Ship can also stay at the buoy and act as an offshore storage unit, taking LNG from other tankers via ship-to-ship transfer. When not engaged in her specialty, the Re-Gas Ship can act as an ordinary LNG tanker carrying cargo to ordinary LNG terminals. LNG ships are some of the most advanced cargo ships in existence, and work under intense operational and security scrutiny. I’ve never been aboard a LNG tanker that wasn’t very well-kept and extremely well run. The crews are some of the best, and they’re proud of their ships and of their stellar safety record, as well they should be. Since the METHANE PIONEER took her first cargo from Louisiana to the UK in 1959, there have been a total of only eight incidents worldwide (see Sandia National Laboratories 2008 Report), none of them leading to loss of life or breach of cargo containment. That covers the basics, I think – going ahead, I’ll begin to look at more contemporary, day-to-day topics with regard to LNG in shipping – and there are lots to talk about. Please comment and let me know if there’s anything of importance you feel I’ve missed, or given short shrift to. Your response is important! LNG and Natural Gas – How Will They Impact the Maritime World? LNG and natural gas have been headline players – and frustrating ones – for over a decade now. There was a time, very recently, when imports were the hot topic, and the hot air expended in debates about terminal siting, waterway access, domestic vs foreign tankers, and security, seemed to almost equal the volumes of natural gas being discussed. Now we comes shale gas and the heated rhetoric around it – phrases such as “awash in natural gas” or “100-year supply” come to mind. Natural gas looks set to become the dominant fuel of the 21st century. How will all this affect the maritime sector? Should the United States export our gas, or keep it at home? Will natural gas become the dominant domestic motor fuel? Can inexpensive natural gas derail the newfound interest in nuclear power generation – and will it replace coal? Tied to those factors, and given the dramatic fluctuations over the last decade, where will the price go next? Will the independent US market for gas, with its independent pricing, stay the same – or will gas end up, like oil, with a world price? What about shale gas developments overseas – could they take up what looks like a good market for US export gas? These questions and many more will occupy us for decades to come. And they’ll have a bearing on the maritime world, too, such as US cargoes going in US bottoms with US crews, which could be a shot in the arm for the US merchant marine; or the barging of smaller quantities of LNG coastwise or over inland waterways. And LNG as a marine fuel is just taking off. This blog will explore these issues and more. And make it a two-way conversation! Comment and criticize, correct and amplify – your advice and point of view will be very important if a true picture is to emerge. Hope you’ll avail yourself of the opportunity to do that! Also please visit my personal blog: http://www.reidbsprague.net/the-chain-locker-blog.html which has more information and links to social accounts. I look forward to hearing from you!